While we all know that playing sports can be great for your mental and physical health, soccer may be one of the best sports of all. But what health benefits does soccer offer in particular? If one of your New Year’s Resolutions is to better your health, there’s no better sport to get involved in than soccer. Here are just some of the health benefits you can experience when you learn to play soccer. Soccer is a sport that relies on a lot of continuous running with little stopping. As such, your heart will be pumping from start to finish. This will help improve the health of your lungs and heart, ensuring that they get stronger over time. The more you play soccer, the better your heart health will be in the present and future. This means it reduces your chance for heart disease, improves blood pressure, and reduces plaque build-up in your arteries. When you improve your heart as a muscle, you’re also helping pump more blood to your extremities. This thusly improves your endurance over time, ensuring you can play for longer periods of time without getting as tired. People typically see soccer as an endurance sport. As we mentioned above, the cardiovascular workout you receive from this game will improve your endurance over time. However, soccer also works to increase your strength and build your muscles as well. Running around all day will inevitably result in stronger legs, thicker thighs, and toned calves. But it isn’t just your legs that will benefit from a soccer workout. When you play soccer, you’re engaging nearly every muscle group as you jump, pivot, kick, dive, and block. Say ‘hello’ to toned abs and a stronger back. With 11 players on each team, soccer coaching will teach you to use your legs, head, and torso to score and pass. If you’ve ever overheard soccer coaching, you know most coaches will harp on the coordination of their players. This is because soccer is more than just kicking a ball back and forth. Coordination is needed to pivot between players, make swift decisions, and perform soccer skills that put you ahead of the other players on the field. Soccer relies on foot-eye coordination to improve complex motions you can perform with your feet. This can help you make better passes, shoot the ball with increased accuracy, and lead to better balance. Soccer is one of the most multi-dimensional sports out there, whether you’re just getting into it or have been playing for years. 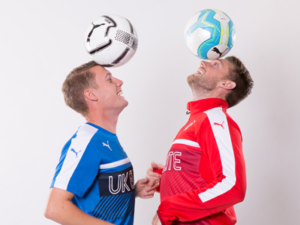 When you want to learn soccer skills, engage in a soccer program near you, or simply get soccer coaching tips and tricks, rely on U.K. Elite Soccer today.